“We don’t do this because it’s easy!” Those were my first words on returning to the club tent after finishing the Northern Cross-country Championships race over the beautiful grounds of Harewood Hall, near Leeds in Yorkshire. It certainly wasn’t easy. At 12k, championship races are a third longer than Harrier League races. The competition is obviously tougher. The course? Well, every cross-country course is tough. Last year’s Northerns in Knowlesly was the most hellish course I have run, not because of the hills, but because of the incessant mud. Conditions were kinder at Harewood Hall. There was actually some grass in places. But a race can be a challenge for other reasons. My last race was the Durham Cathedral relays two weeks ago. I felt the beginnings of a cold that morning. It turned out to be full blown ‘flu. A week off work, spent mostly in bed, and an additional week recovering. The day before the Northerns, I ventured out on my first run since Durham – an easy 2.5 miles – in order to gauge whether I should run in the Northerns at all. Even after that run, I still wasn’t sure, still suffering with a phlegmy cough and a very snotty nose. But the coach down to Leeds was booked and I would be going down with my son anyway, so my rationale was that, as my test run didn’t give me a definite ‘no’ then I would run and rely on how my body felt to dictate how hard I would run it. Towards the end of a cold or infection, I do feel that a run can actually speed up the process that clears the gunk from your lungs. I didn’t want to DNF, but if I felt so bad, woozy for example, then I would do the sensible thing and either slow down, walk or pull out altogether. What this also meant was that I had run a grand total of only 37 miles in almost 8 weeks due to illness and recovery from an operation. The fitness I have lost, as well as strength and stamina, in this time must be pretty significant. This hard cross-country race was certainly not going to be easy. We boarded the coach early in the morning and made the 2 hour trip to Harewood House, arriving in time for the first junior races. It would be a long day – arriving a full five hours before the senior men’s race. The forecast was for 11 degrees Celsius, but it was far from that with a cold wind and drizzle in the air for most of our time waiting. It did warm up just before race time though. Instead of the usual 3-lap course, we would be running 2 laps on a longer course. On walking it before any of the races, the conditions under foot were great; a few muddy bits, but nothing extreme. But there would be nine races before ours with some big fields. Plenty of time for the mud to form. It looked an excellent course though. The organisers had ensured that every opportunity to make us go up a hill was taken and there were some big hills; not ridiculously steep, but long. Time for the race arrived. My warm-up was OK as I cheered on the senior ladies in their race. We had a good men’s squad out, one of the largest clubs there, but we were against some big running clubs. What I have noticed is that Newcastle has a huge number of clubs, whereas most other cities have a dominant club, such as Leeds City, Liverpool, Sale and Blackburn Harriers, which attract the most talented runners in the area. Gosforth is a suburb in the north of Newcastle and there isn’t a Newcastle Harriers, so the talent in Newcastle seems to be a bit more dispersed. This makes the local Harrier League more exciting, but means the regional team competition winners are unlikely to be a club from Newcastle. I was also surprised how few northeast clubs were taking part. Several first division Harrier League clubs couldn’t get a full team out. Rather than the usual narrow channel with runners lining up for 50 yards behind it, some therefore taking 15 to 20 seconds to cross the line, this start line was about 150 yards long for a race of almost 800 runners with clubs allocated to start pens. The sight at the gun is amazing, like a middle ages war film with a huge, multi-coloured army rushing towards to the enemy, swords or spears drawn. OK, maybe no spears or swords, but you get the drift. There are also no slow, medium or fast packs. It is a mass start, with some international level athletes on the same line. The first third of a mile is uphill, levelling out before dropping to complete the mile. It was a bit crowded, but the course was fairly wide, so very manageable. I was actually feeling fine, running it in 6:57. My lungs were holding out and I was about where I expected to be in the pack. I was making ground on the muddy bits and the downhills, where my technique is quite good, and losing ground on the uphills, presumably due to a lack of strength, but I felt OK. I had made the right decision to run. I had two clubmates to run with, both around the same level as me, and that definitely spurred me on. There were a noticeable number of drop-outs on the first lap, whether that be due to injury or something else. The second mile includes two uphills, one lasting a good half of that mile. Conditions had definitely deteriorated during the day. 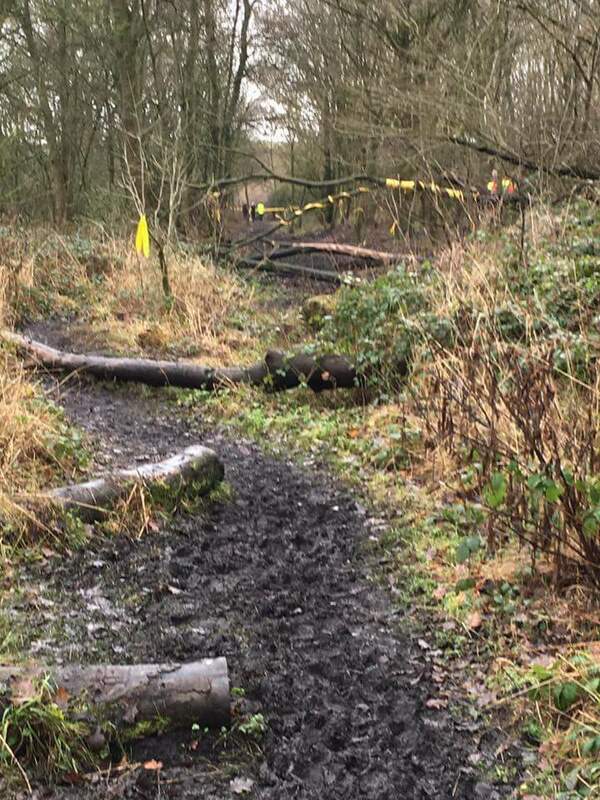 Areas that were a bit squelchy on the course recce were now just mud. The uphill second mile done in 8:04. Mile 3 was completely downhill. I let loose and overtook quite a few, completing it in 6:36. Each lap was about 3.6 miles. I found the last half mile of the lap extremely tough. It started with a sharp hill, the steepest part of the course, and deceptively long at about 300 metres. I was expecting my lungs to give up first, but, instead, it was my legs. The hill seemed to sap the strength from them. Up until that point, I had been generally passing people. From then on, it was the opposite. The sharp uphill was followed by an equally steep downhill taking us back to the start/finish area and onto the second lap and another long uphill. The course conditions had deteriorated further. A longer course is probably better in that respect with each section being used fewer times – two laps instead of three. Nevertheless, it was often now pointless trying to find a route offering firmer, less muddy ground. Even the sides of the course were cut up. There’s a certain camaraderie that exists between the Northeast clubs during the regional and national events. Supporters obviously from other Northeast clubs and officials from the Northeast give you encouragement because you are wearing a club vest they recognise. The number of “Well done Gosforth”s I heard far outweighed the number of Gosforth spectators. At one point early on lap two, I was running just behind a Heaton Harrier, who I normally beat in the Harrier League, on a fairly grassy part of the course. He noticed we were closing in on a patch that was deep mud with better ground either side. He pointed it out to me and moved over so that we could both avoid it. I gasped a word of thanks and tried to stay with him, but he pulled away as we started making our way up the second big hill on lap two. I finished in 466th position out of a field of 761 in 55:31. That’s the 61st percentile, my worst performance in that respect in any race ever. But I was really glad I ran on such a beautiful course. 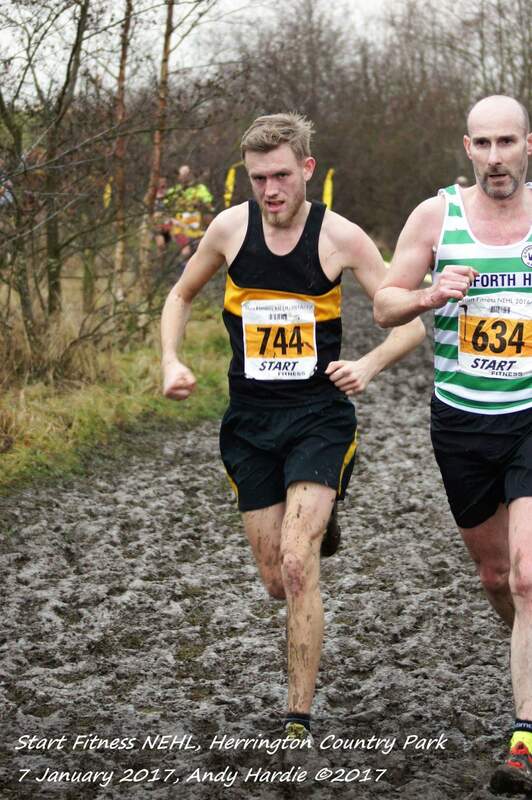 I was 6th counter for the club, meaning that we finished in a very respectable 29th position, beating first division Harrier League clubs like North Shields Poly, Heaton Harriers and Sunderland Harriers. My only regret was that the hog roast catering van was packing up when we got back to the tent. I had been looking forward to that. Never mind. No time for cool down as we packed up the tent and headed back to the bus for a well earned sit down that would no doubt result in some tight muscles tomorrow. Away days with the club are always a good laugh and experience. It takes time and effort to arrange all these things so thanks to those who do it. Our next away day is the national championships in London at the end of February, but we have a Harrier League event before that. Now to focus on finishing my recovery from illness and start trying to regain both my fitness and strength. That won’t be easy either.